Today, we took the next step in our merger with Sprint by filing our Public Interest Statement with the FCC. This filing is an important part of the process and lays out in depth how the public will benefit from the merger. And – spoiler alert – there’s a ton of consumer benefit in this deal! T-Mobile and Sprint coming together lays the foundation for the U.S. to continue its global technology leadership well into the 5G era… and in so doing, will spur Verizon and AT&T to invest in a huge capacity increase that will drive down the price per gigabyte across the entire industry. The stakes are high – technology leadership for the next decade is at stake. Here’s a fact that should worry everyone: Other nations are moving ahead in the race to 5G, and what happens in the first few years of a new technology lifecycle is hugely important. Just look at 4G. The U.S. started rolling it out nationwide before almost anyone else, getting the tech into hands of innovators and entrepreneurs, and today 99.7% of Americans are covered by 4G LTE. The result: America and our innovators led the global mobile economy for the last decade. Uber, Snap, Venmo, Instagram – are all products and businesses built in part on the 4G mobile web. Analysts estimate this early leadership generated billions in economic value and millions of new jobs here in America. All because the U.S. led with broad 4G LTE. With 5G, the stakes are much higher – because 5G is a massive inflection point in the user experience. At full deployment the New T-Mobile will deliver fiber-like speeds. I’m talking about average speeds at a blazing 444 Mbps, covering about two-thirds of the country, with jaw-dropping peak speeds up to 4.1 Gbps!! And you won’t have to wait long to see these amazing increases in speed and performance. By 2021 our engineers are planning to deliver 5G speeds 5X faster than the LTE speeds being delivered on the nation’s fastest LTE network today… that is of course the T-Mobile network. During that same time Neville and his team will also be increasing our LTE speeds! But, if we don’t take decisive, positive action, we risk ceding global leadership in both 5G AND the entire next wave of technology to a country other than America. We cannot relinquish our leadership here and the New T-Mobile will deliver on these capabilities within the first couple of years of bringing these two companies together. As a country we cannot afford to miss this opportunity and the New T-Mobile is fully prepared to do our part, and to do it fast! Of course, all wireless companies will eventually roll out some form of 5G, and both T-Mobile and Sprint have pledged to deploy 5G on our own. But the reality is that T-Mobile’s 5G network will be broad – though not deep, except in select markets. And, Sprint’s 5G network will be deep in some markets, but not broad. And we believe that no one else – not Verizon, not AT&T, not Dish, not Comcast, not Charter – will have the breadth AND depth we can bring together with Sprint … the breadth and depth needed to deliver a truly breakthrough 5G network in the formative and early innovation years of 5G. The New T-Mobile will invest nearly $40 billion and have the complementary spectrum assets and capacity needed to create a broad and deep 5G network nationwide – 5G for All – in the early years of the 5G innovation cycle – the years that will determine if American companies and talent lead or follow in the 5G era. A network capable of answering the competitive challenge from abroad, the kind of network required to fuel U.S. innovation early and create the conditions for American companies and innovators to continue to lead the world. That is what the New T-Mobile will deliver. Consumers will pay less and get more. 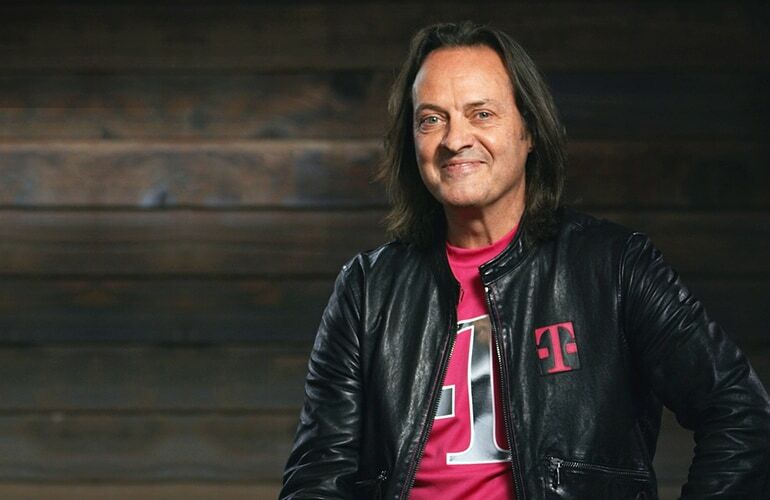 Over the last five years, T-Mobile has dramatically changed U.S. wireless … for good. Ending 2-year service contracts and overages, enabling smartphone upgrades without the wait, freeing people to travel with their phones on, unleashing unlimited data, simplifying rate plans, and more. Each Un-carrier move has forced a competitive response, and altogether, we’ve generated billions in value for consumers through lower prices and better service! Now imagine putting that into overdrive for the future. That’s what I envision for the next five years and beyond with the New T-Mobile, and it’ll make the last five years look mild by comparison. We are just getting warmed up! The New T-Mobile will be a turbocharged disruptor that will deliver better value and lower prices, just like we have over the last five years of the Un-carrier. This deal will create a massive increase in capacity, causing the cost of delivering a gigabyte of data to plummet. And that’s not just at the New T-Mobile … that’s industry wide. Don’t just take my word for it! Analysis by renowned economist Dr. David Evans concludes that the building of the New T-Mobile 5G network will provoke competitive responses from Verizon and AT&T that will result in a decrease in the cost of a GB of up to 55% and over a 120% increase in mobile data supply for all wireless customers. And innovators will create new ways to use all that extra capacity to benefit consumers. In other words, consumers pay less and get more! And no one wins in this deal more than T-Mobile and Sprint customers. As soon as these networks come together in their area, our customers will quickly see better speed, coverage and performance. This deal will create MORE competition. This deal is needed to create a robust and disruptive competitor – because for all the success we’ve had as the Un-carrier, Verizon and AT&T are still massively dominant. Even after our merger, Verizon and AT&T each have market capitalizations that are more than double T-Mobile and Sprint combined and they control about two-thirds of the market share along with 70% of wireless revenues. This merger is about creating a company that can TRULY compete for the long term with the massive incumbents, who are getting bigger every day. And, the merger is needed for us to compete against new entrants like Comcast, Charter, DISH and others – as wireless, broadband and video converge. Fact is, there’s no longer a standalone wireless industry. It’s a wireless/video/broadband industry – with lots of players competing to connect customers to the Internet. AT&T is the country’s #1 TV provider, and Comcast added more wireless customers last year than AT&T and Verizon combined. And 1 in 5 Americans use their smartphone as their only access to the Internet now, a figure that has more than doubled in the last few years. The industry is evolving beyond traditional lines, and the New T-Mobile will bring new competition to areas that badly need disrupting. Millions more Americans will finally get meaningful broadband competition. Internet access is like electricity. Without it, economic opportunities are closed off, and people – and entire communities – are at risk of being left behind. According to the latest figures, nearly half – 48% – of Americans have no in-home broadband option or just one provider option! That’s unacceptable! And, the New T-Mobile will put an end to it with increased choice! The combined company’s 5G network will deliver mobile broadband speeds in excess of 100 Mbps to roughly two-thirds of the population in just a few years and 90% of the country by 2024. This is a mobile connection so fast, millions will be able to cut the cord with Comcast, Charter and the rest. We’ll offer both in-home broadband services and mobile broadband, so customers can pocket the savings from eliminating that pricey wired in-home broadband bill every month if they choose. These cable/broadband providers are some of America’s most hated companies in the market, and for good reason – they treat their customers horribly because so many of their customers don’t have any choice! Personally, I can’t wait to bring the fight to them! In fact, I plan for the New T-Mobile to be the country’s fourth largest in-home ISP by 2024, freeing millions from the likes of Comcast and Charter in the process! Rural Americans win big with better service and more competition. Nowhere is competition more lacking than in parts of rural America – for both wireless services and broadband. This deal enables New T-Mobile to increase coverage in rural America and create more competition for wireless, broadband and beyond. Case in point: we estimate that 20-25 percent of those new broadband subscribers will be located in rural areas. Even better, the broad geographic reach of our 5G network will bring critical applications to small towns and rural communities. For instance, there are only 13.1 physicians per 10,000 people in rural areas (vs 31.2 physicians per 10,000 people in urban areas). The New T-Mobile’s 5G network could bring telemedicine and distant specialists together with rural residents for faster, higher-quality medical care. And, the New T-Mobile 5G network will support new agribusiness applications like allowing farmers to monitor crops, climate and livestock, increasing quality, safety and efficiency while lowering costs in America’s heartland. This deal will create thousands of new U.S. jobs … and drive major economic stimulus across the ecosystem. Naysayers will try to tell you this deal will hurt jobs; that’s just flat out wrong. It’ll create thousands of new jobs across the country. In fact, our business plan calls for the New T-Mobile to employ more people on day #1 and going forward than Sprint and T-Mobile would employ separately. People who will help build the new network; extend the Un-carrier customer care model to a wider subscriber base; and support customers in growing segments like in-home broadband, enterprise, and IoT. This deal creates jobs from day 1 – period. In fact, our plans call for the creation of 3,000 direct jobs in year one, increasing to over 9,600 direct and indirect jobs by 2021 and over 11,000 FTE’s by 2024. Every day we will have more jobs as the New T-Mobile than the two stand-alone companies would have on their own. As we build out our new 5G network and bring these services to all parts of the country we will create thousands of job opportunities. Here is another important part of our plan. To better serve America’s rural and small-town communities, the New T-Mobile will add at least 600 new stores and build up to 5 of our advanced customer experience centers. This will result in thousands of new jobs to these parts of America. As I noted earlier, we are planning to invest nearly $40 billion in our business and network over the next three years alone, and that will be a huge economic stimulus on its own. That amount represents more than either T-Mobile or Sprint had planned to invest on their own. Don’t think for a second that Verizon, AT&T, Comcast, Charter or others will stand still. They will feel the pressure and need to accelerate investment to try to keep up, and that’s just more goodness for the economy. T-Mobile has a history of transactions that create job growth, and this will be another one! Remember that MetroPCS deal five years ago? Five years in, and nearly 3X the number of people come to work on behalf of Metro compared to the time of the merger. We have a track record on job growth – and it’s a damn good one! And many of those new employees won’t just be joining any place. T-Mobile is the BEST place to work in wireless. Our employees are customer obsessed, and that’s the biggest reason we are the most loved brand in wireless. But I’m not satisfied with being the best place to work in wireless. We want to be the BEST place to work anywhere… for more and more people who are just as customer-obsessed as we are. And that includes tens of thousands of Sprint employees. I honestly can’t wait to bring these teams together, because if I’ve learned one thing about the Sprint team in the last five years it’s this: they are tough as hell. They just keep pushing and fighting and surprising. Together, this combined team will be an incredible, powerful force for change … a force to be reckoned with. That is what this merger is about. It’s about taking this fight – on behalf of consumers – to the next level. Because the next wave of mobile broadband is too important not to fight for. At the Un-carrier, that is what we do. And, of course, we won’t stop! P.S. Here come the lawyers below. T-Mobile and Sprint and their respective directors and executive officers and other members of management and employees may be deemed to be participants in the solicitation of consents in respect of the proposed transaction. Information about T-Mobile’s directors and executive officers is available in T-Mobile’s proxy statement dated April 26, 2018, for its 2018 Annual Meeting of Stockholders. Information about Sprint’s directors and executive officers is available in Sprint’s proxy statement dated June 26, 2018, for its 2018 Annual Meeting of Stockholders, and in Sprint’s subsequent Current Report on Form 8-K filed with the SEC on July 2, 2018. Other information regarding the participants in the consent solicitation and a description of their direct and indirect interests, by security holdings or otherwise, will be contained in the joint consent solicitation statement/prospectus and other relevant materials to be filed with the SEC regarding the acquisition when they become available. Investors should read the joint consent solicitation statement/prospectus carefully when it becomes available before making any voting or investment decisions. You may obtain free copies of these documents from T-Mobile or Sprint as indicated above.